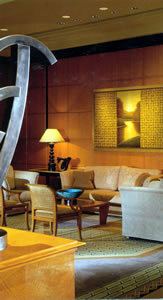 Four Seasons hotels have a remarkable reputation around the world. Any traveller looking for a place to stay which combines discreet luxury with a fine location and attentive service knows that, if he chooses a Four Seasons, his requirements will be met. And thus it was in the City of St Francis, when this particular visitor to California arrived at 757 Market Street, the home of the Four Seasons San Francisco. Actually, of course, my taxi deposited me and the regiment of Globetrotters (I never travel lightly) at the rear entrance. For Market Street is a busy thoroughfare and does not take kindly to motor cars which need to stop for several minutes to deliver British persons with too much luggage. That the hotel has such a convenient facility hidden away is entirely typical of the care with which a Four Seasons hotel treats its customers. Having done the usual things at the Reception desk, I went in one of the other set of lifts (which afford access to the hotel’s 277 bedrooms) to the 9th floor and my billet. (I should at this point pause to commend the members of staff at Reception for their courtesy and efficiency, and also for their remarkable facility to remember my name at all subsequent encounters.) Room 918 was a Deluxe Double and therefore around 450$-600$ a night for two, breakfast extra. (As always, nowadays, one needs to check on the hotel website for the rates for specific dates.) As I expected, this was bright and comfortable accommodation, although readers might wish to dig deeper into their pockets for one of the stylish suites, of which I present to you a picture. In my hallway were the mini-bar and the fitted wardrobe. The bedroom was about 15 feet by 12 feet and was decorated in muted tones of green, yellow and brown. 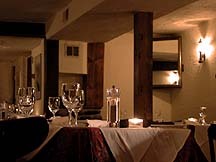 Two table lamps and a standard lamp provided the light. In the wooden sideboard I found the dvd player and the safe. Other furniture included a writing table, two desk chairs in brown leather, one easy chair and a window seat. Through that window was a view over the town, with the East end of the nearest Catholic church dead centre. The air conditioning was, of course, effective and my night-time comfort was assured by a bed which had been made specially soft for me. Along with the iron and ironing board – two items in which, being a slave to the uncreased shirt, I always delight – was a can of spray-starch, yet another indication of that attention to detail for which Four Seasons hotels are famous. The bathroom was clean and sparkling, with one wash basin, a tub (broad, but shortish), a separate shower and a separate loo. 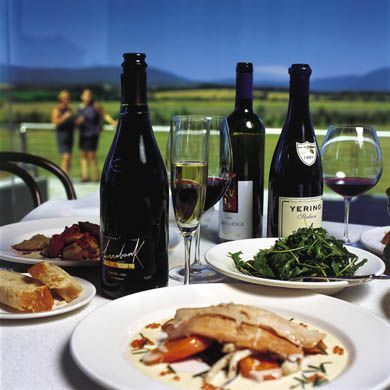 Breakfast, lunch and dinner are all served in the Seasons Restaurant (pictured). 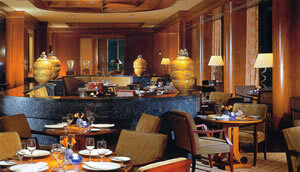 I was not able to try the food there on this occasion, but on previous visits I found it to be of a good standard. Four Seasons hotels deserve their fine reputation. 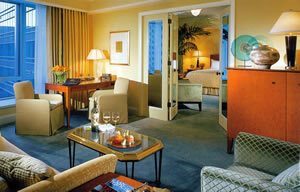 The Four Seasons Hotel San Francisco is a good example of why they are regarded so highly. 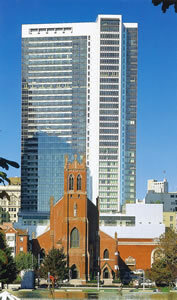 757 Market Street, San Francisco, California 94103, U.S.A.
Prices for specific dates should be checked on the hotel website.